2: Streakers got a lot more aloof in the 23rd Century. 1. Time to implement the new concussion protocol. 1. My opinion of the NFL for about the past 10 years. 2. Looks more like professional full contact rhythm gymnastics with an interesting choice in officiating personnel. 1. Those throw-back uniforms are pretty weak. 2. Give it up, lady, they’re all latently gay. 1. Pinocchio really embraced his wooden side in the future. 2. Wow I don’t think i ever saw pubics here on gss before….Good Show Sir! 1. 23rd century face mask design led to a plethora of eye gouging and nose tweaking in the pileups. 2. One aspect of 23rd century football strategy focused on new and interesting ways to create delay-of-game penalties. For the authentic Superbowl experience, try opening this site on a 90s dial-up. Cover 1: He must be the tight Ent. Cover 2: Isn’t there a similar cover on this site with American footballer players playing in a very gymnastic way? 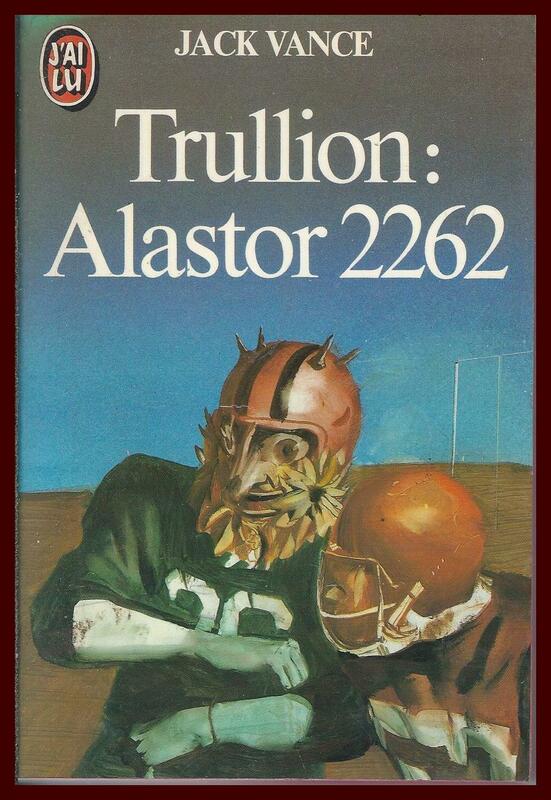 Horrible as the covers are, they actually depict what’s in the book — the main character returns to the planet Trullion from the space force and takes up a football/water polo/circus trapeze like game to earn some money to solve his brother’s murder. There’s lots of play-by-play description of the game, but no rules given for it, which makes it all the more bizarre, but it’s fun. I think Vance was poking fun at modern sports commentators with it. The naked lady serves as the mascot of each team, and she stands at the goal wrapped in a flimsy robe. The players score points by ripping her clothes off and exposing her. That said, for the first cover, none of the players was a giant chicken. @Tracy ….an albino in a Mardi Gras mask? There were naked ladies and a sport, but I don’t think it required football uniforms, nor were any of the players albinos wearing chicken head masks, or possibly taxidermied badger heads with feathers/flowers. Or whatever species the things on the second cover are. Although cover girl #2 has an appropriate expression. And yet they both relate to the main plot better than the one posted earlier. Scoring points by ripping the clothes off the mascot may well reflect misogyny on the part of Vance, but it’s also just an extension of the whole American cheerleader ethos, perhaps not out of line with the rest of the story’s satire of sport.